In 1990, author Amy Gary discovered unpublished manuscripts, songs, personal letters, and diaries from Margaret tucked away in a trunk in the attic of Margaret’s sister’s barn. Since then, Gary has pored over these works and with this unique insight in to Margaret’s world she chronicles her rise in the literary world. Clever, quirky, and wildly imaginative, Margaret embraced life with passion, threw wild parties, attended rabbit hunts, and lived extravagantly off of her royalties. She carried on long and troubled love affairs with both men and women, including the ex-wife of John Barrymore, and was engaged to a younger man (who was the son of a Carnegie and a Rockefeller) when she died unexpectedly at the age of 42. 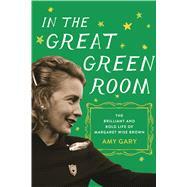 AMY GARY has cataloged, edited, and researched all of Margaret’s writings for the last twenty-five years. Amy has been covered in Vanity Fair, Entertainment Weekly, and The Wall Street Journal. She was formerly the Director of Publishing at Lucasfilm and headed the publishing department at Pixar Animation studios. Foreword by James Stillman Rockefeller, Jr.